In a pot of boiling water,place the rice and cook until light and fluffy. Mix the oil, oregano, thyme, paprika, cayenne pepper, and garlic with the chicken breasts. For the bean salad, in a large bowl mix the black eyed beans, tomatoes, sweet corn, scallion, sun dried tomatoes, lime juice and zest and coriander. Place on a grill pan or under the grill on medium to high heat. Place the chicken breasts on it or under a grill and cook for 5 - 7 minutes. Once golden brown turn and grill for a further 5 - 7 minutes until cooked through. 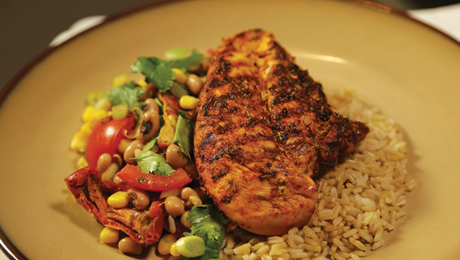 Serve the chicken with the rice and bean salad.